Sir John Soane (1753-1837) has come to be regarded as one of the great architects of late 18th and early 19th century Europe, and contemporary architects and designers are becoming increasingly influenced by the subtleties of the unique 'Soane style'. Dorothy Stroud's classic book, which is appearing in paperback for the first time, in an updated second edition, is the culmination of a lifetime's research. It brings together all the threads in her previous writings on Soane, combining a concise biography of the architect with a comprehensive and fully illustrated survey of his works. After studying in Italy, Soane built up a considerable private practice and a reputation that secured his appointment in 1788 as architect to the Bank of England, where over a period of forty-five years he designed a vast complex of courts and offices. With his appointment to the Office of Works in 1815, he became responsible for public buildings in Whitehall and Westminster, which entailed the designing of a Royal entrance and gallery in the House of Lords, new Law Courts, Privy Council Offices and a State Paper Office. 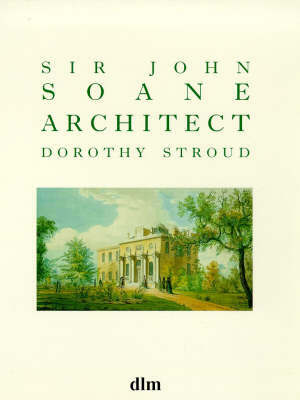 Dorothy Stroud was an expert on 18th and early 19th century architecture, and in particular on Soane, and was Assistant Curator of the famous Sir John Soane's Museum in Lincoln's Inn Fields for many years: this house contains his priceless collection of works of art, books and architectural drawings. She wrote a number of other books including Capability Brown; George Dance, Architect, 1741-1825; Humphry Repton; and Henry Holland, His Life and Architecture.